Francesco Sabatini by Goya, c. 1775-79. Convent of San Pascual, at Aranjuez. Francesco Sabatini (1721 – 19 February 1797), also known as Francisco Sabatini, was an Italian architect of the 18th century who worked in Spain. 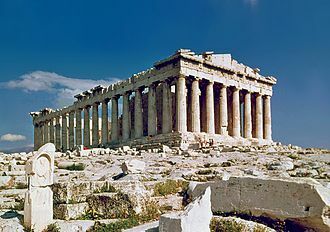 Born in Palermo, he studied architecture in Rome. 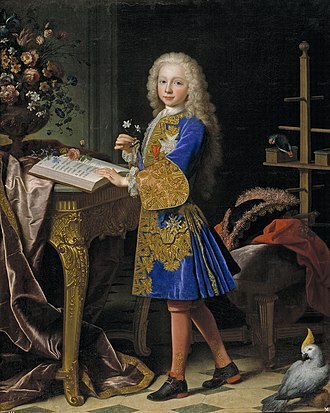 His first contacts with the Spanish monarchy was when he participated in the construction of the Palace of Caserta for the King of Naples and Duke of Parma and Tuscany, Charles VII, the future King Charles III of Spain. When he was raised to the Spanish throne, he called Sabatini to Madrid in 1760, where he was positioned above the most outstanding Spanish architects of the time. He was appointed as Great Master of Royal Works, with the rank of lieutenant colonel at the Engineers Corps, simultaneously designated also as an honorary academician of the Academia Real de Bellas Artes de San Fernando. Sabatini's works are all encompassed within the neoclassical tradition, but he was not inspired fundamentally by ancient Greece and Rome, but by Italian Renaissance architecture. His talent as an architect and the king's support king resulted in many commissions and professional recognition. 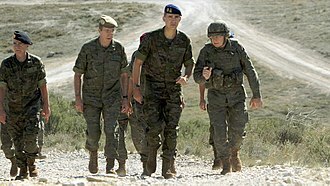 He was promoted to lieutenant general of the Engineers Corps, was granted the degree of Knight of the Order of Santiago, and had direct access to the innermost royal circle after his designation as gentilhombre de camara (Gentleman of the Royal Chamber). The Gardens of Sabatini (located in front of the north facade of the Royal Palace of Madrid, between the Bailén street and the hill of San Vicente) were not designed by him; they were created in the 1930s on the site formerly occupied by the stables constructed by Sabatini. Furthermore, Sabatini was responsible for building the Arms Factory of Toledo, the headquarters for the Wallon Guarda in Leganés (presently part of the Universidad Carlos III de Madrid), a convent in Valladolid (Santa Ana) and another one in Granada (Comendadoras of Santiago) and the well-known Chapel of the Immaculate in the Cathedral of Osma, also called of Palafox. 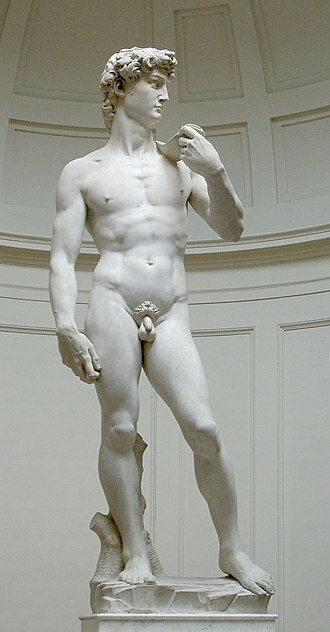 He died in Madrid in February 19, 1797. Works of the Royal Palace of Madrid until its conclusion (1760–1764). Planning of the sewage system of Madrid, which was paved with stones and cleaned (1761–1765) for the urban reform of the city of Madrid. Royal Customs House in the Alcala Street (1761–1769), present seat of the Ministry of Property. Tombs of Ferdinand VI of Spain and Bárbara de Braganza, located in the Church of Santa Barbara of the Convent of the Salesas Reales, with Francisco Gutiérrez. Convent of San Pascual, in Aranjuez (1765–1770). Renovation of Cuesta de San Vicente (1767–1777). Prolongation of the Southeastern wing of the Royal Palace begins (1772). Reconstruction of the monastery of the Comendadoras of Santiago (1773). Direction of works of the Basilica of San Francisco el Grande (1774–1784). Puerta de San Vicente (1775). Casa de los Secretarios de Estado y del Despacho, also known as the Palace of the Marquess de Grimaldi and Palace of Godoy (1776). Convent of Franciscan of San Gil in the Prado de Leganitos (1786–1797), recently transformed by Manuel Martín Rodriguez. 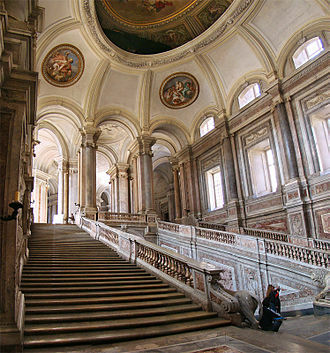 Change of the direction of the main stairs of the Royal Palace by desire of Charles IV of Spain. 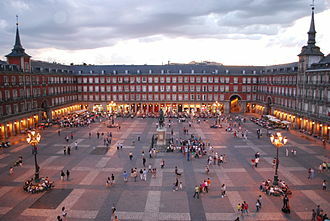 Reconstruction of the Plaza Mayor de Madrid after the 1790 fire, together with Juan de Villanueva. Wikimedia Commons has media related to Francesco Sabatini. Granada is the capital city of the province of Granada, in the autonomous community of Andalusia, Spain. Granada is located at the foot of the Sierra Nevada mountains, at the confluence of four rivers, the Beiro, the Darro, the Genil and the Monachil. 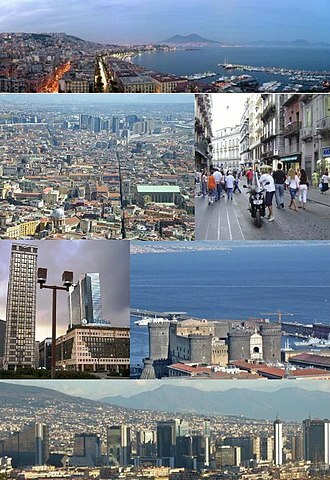 It sits at an elevation of 738 m above sea level, yet is only one hour by car from the Mediterranean coast. Nearby is the Sierra Nevada Ski Station, where the FIS Alpine World Ski Championships 1996 were held, about 3. 3% of the population did not hold Spanish citizenship, the largest number of these people coming from South America. Its nearest airport is Federico García Lorca Granada-Jaén Airport, the Alhambra, a Moorish citadel and palace, is in Granada. It is the most renowned building of the Andalusian Islamic historical legacy with its cultural attractions that make Granada a popular destination among the touristic cities of Spain. The Almohad influence on architecture is preserved in the Granada neighborhood called the Albaicín with its fine examples of Moorish. Granada is well-known within Spain for the University of Granada which has about 80,000 students spread over five different campuses in the city, the pomegranate is the heraldic device of Granada. 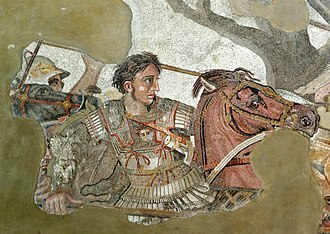 The region surrounding what today is Granada has been populated since at least 5500 BC and experienced Roman, the most ancient ruins found in the city belongs to an Iberian oppidum called Ilturir, in the region known as Bastetania. 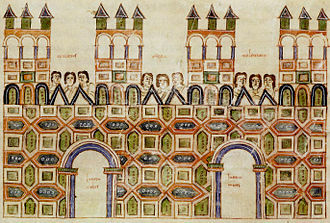 This oppidum eventually changed its name to Iliberri, and after the Roman conquest of Iberia, the Umayyad conquest of Hispania, starting in AD711, brought large parts of the Iberian Peninsula under Moorish control and established Al-Andalus. In the early 11th century, after a war that ended the Caliphate, the Berber, Zawi ben Ziri, established an independent kingdom for himself. 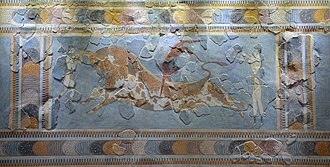 Jewish people were established in another close to Illiberis, called Gárnata or Gárnata al-Yahūd. Granadas historical name in the Arabic language was غرناطة, the word Gárnata possibly means hill of strangers. Tuscany is a region in central Italy with an area of about 23,000 square kilometres and a population of about 3.8 million inhabitants. Tuscany is known for its landscapes, history, artistic legacy, Tuscany produces wines, including Chianti, Vino Nobile di Montepulciano, Morellino di Scansano and Brunello di Montalcino. Having a strong linguistic and cultural identity, it is considered a nation within a nation. Tuscany is traditionally a popular destination in Italy, and the main tourist destinations by number of tourist arrivals are Florence, Montecatini Terme, Castiglione della Pescaia and Grosseto. The village of Castiglione della Pescaia is the most visited destination in the region. Additionally, Lucca, the Chianti region and Val dOrcia are internationally renowned, Tuscany has over 120 protected nature reserves, making Tuscany and its capital Florence popular tourist destinations that attract millions of tourists every year. 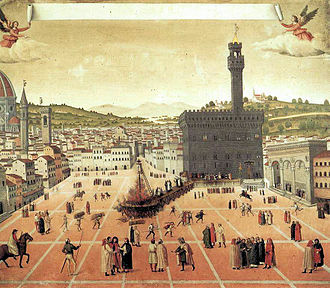 In 2012, the city of Florence was the worlds 89th most visited city, roughly triangular in shape, Tuscany borders the regions of Liguria to the northwest, Emilia-Romagna to the north and east, Umbria to the east and Lazio to the southeast. The comune of Badia Tedalda, in the Tuscan Province of Arezzo, has an exclave named Ca Raffaello within Emilia-Romagna, Tuscany has a western coastline on the Tyrrhenian Sea, containing the Tuscan Archipelago, of which the largest island is Elba. Tuscany has an area of approximately 22,993 square kilometres and crossed by major mountain chains, and with few plains, the region has a relief that is dominated by hilly country used for agriculture. Hills make up nearly two-thirds of the total area, covering 15,292 square kilometres, and mountains. Plains occupy 8. 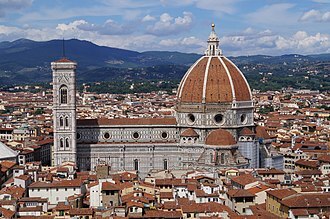 4% of the total area—1,930 square kilometres —mostly around the valley of the River Arno, many of Tuscanys largest cities lie on the banks of the Arno, including the capital Florence and Pisa. 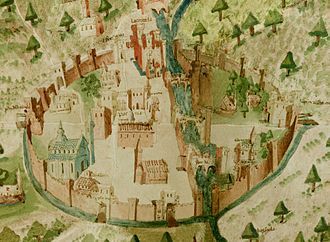 The pre-Etruscan history of the area in the late Bronze and Iron Ages parallels that of the early Greeks, following this, the Villanovan culture saw Tuscany, and the rest of Etruria, taken over by chiefdoms. 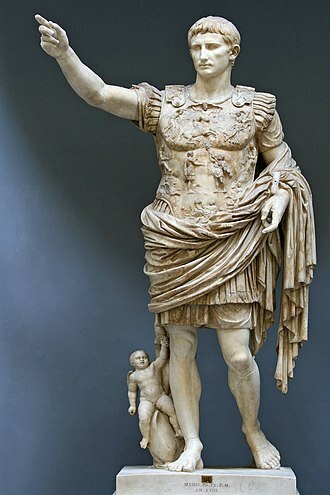 City-states developed in the late Villanovan before Orientalization occurred and the Etruscan civilization rose, the Etruscans created the first major civilization in this region, large enough to establish a transport infrastructure, to implement agriculture and mining and to produce vibrant art. Barbara of Portugal was an Infanta of Portugal and Queen of Spain by marriage to Ferdinand VI of Spain. Born Maria Madalena Josefa Teresa Bárbara, Barbara was the eldest child of King John V of Portugal and his wife, Archduchess Maria Anna of Austria, the princess was baptised Maria Madalena Bárbara Xavier Leonor Teresa Antónia Josefa, her names honouring a number of saints and relatives. She was usually referred to as Bárbara or Maria Bárbara, a never before used among Portuguese royalty, in honour of Saint Barbara. She was a first cousin of the future Empress Maria Theresa as well as Maria Josepha of Austria, although her parents were married in 1708, they remained childless for nearly three years. The King made a promise to God that if an heir to the throne was born, on 4 December 1711 Barbara was born, and, as promised, the King had the Convent of Mafra built. Barbara was born as heiress-presumptive to the Portuguese throne, styled as Princess of Brazil and her status as heiress presumptive lapsed when the Queen gave birth to a son, two years later. Pedro died at the age of two, though another son, born before Pedros death, prevented Barbara from ever being heiress-presumptive again, Barbara had a fine education and loved music. She was considered to marry Louis XV of France, in 1729 at the age 18, Barbara married the future Ferdinand VI of Spain, two years her junior. 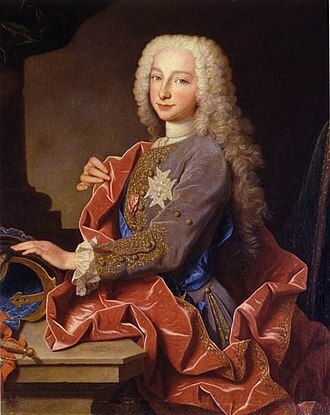 Her brother Joseph married Ferdinands half-sister, the Spanish Infanta Infanta Mariana Victoria, the double marriage was meant to repair the Portuguese-Spanish alliance. Scarlatti followed her to Madrid after her marriage and remained with her, during her husbands reign, Barbara presided over magnificent parties and concerts at the Royal Palace of Aranjuez, which was her favorite retreat. This gave Barbara the time to deepen her relationship with the timid Ferdinand, Barbara was well-educated, adept at languages, an avid reader of many varied subjects and had a love of music. Encouraged by Barbara, Ferdinand fired minister Villarias who was replaced by Carvajal, in contrast to her predecessor as queen, Barbara did not like to flaunt her influence over her spouse and the government policy, and she made a moderately positive impression upon the public. The Royal Palace of Caserta is a former royal residence in Caserta, southern Italy, constructed for the Bourbon kings of Naples. It is one of the largest palaces erected in Europe during the 18th century, in terms of volume, the Royal Palace of Caserta is the largest royal residence in the world with over 2 million m³ and covering an area of about 235,000 m². The construction of the palace was begun in 1752 for Charles VII of Naples, when Charles saw Vanvitellis grandly scaled model for Caserta, it filled him with emotion fit to tear his heart from his breast. The population of Caserta Vecchia was moved 10 kilometers to provide a work force closer to the palace, a silk manufactory at San Leucio resort was disguised as a pavilion in the immense parkland. To provide the king with suitable protection, troop barracks were housed within the palace, the Royal Palace of Madrid, where Charles had grown up, which had been devised by Filippo Juvarra for Charles father, Philip V of Spain, and Charlottenburg Palace provided models. A spacious octagonal vestibule seems to have inspired by Basilica di Santa Maria della Salute in Venice. From 1923 to 1943 the palace was the location of the Accademia Aeronautica, from October 1943 the royal palace served as the Allied Force Headquarters in the Mediterranean area. In April 1945 the palace was the site of the signing of terms of the unconditional German surrender of forces in Italy, the agreement covered between 600,000 and 900,000 soldiers along the Italian Front, including troops in sections of Austria. The first Allied war crimes took place in the palace in 1945, German general Anton Dostler was sentenced to death and executed nearby. In the left hand arc behind the façade, a set of barracks were built, during World War II the soldiers of the US Fifth Army recovered here in a rest centre. The palace has 5 floors,1,200 rooms, including two state apartments, a large library, and a theatre modelled after the Teatro San Carlo of Naples. A monumental avenue that would run 20 kilometers between the palace and Naples was planned but never realized, the palace has a rectangular plan, measuring 247 ×184 m, and the four sides are connected by two orthogonal arms, forming four inner courts. 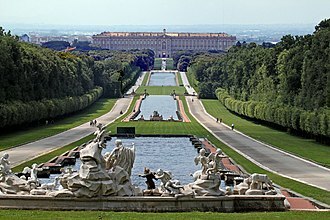 Each floor measures approximately 47,000 m2, but considering the five floors, of all the royal palaces in the world, Caserta is by far the largest in terms of volume, with more than 2 million m³. Behind the façades of its matching segmental ranges of outbuildings that flank the giant forecourt, as at Versailles, a large aqueduct was required to bring water for the prodigious water displays. Like its French predecessor, the palace was intended to display the power, a solecism at Caserta is that above the piano reale, the Kings floor, is another floor of equal magnificence. The enfilades of Late Baroque saloni were the heart and seat of government, Caserta provided a royal refuge from the dust and factions of the capital, just as Versailles had freed Louis XIV from Paris. The royal palace has more than 40 monumental rooms completely decorated with frescoes when, in comparison, the garden, a typical example of the baroque extension of formal vistas, stretches for 120 ha, partly on hilly terrain. Juan de Villanueva was a Spanish architect. Alongside Ventura Rodríguez, Villanueva is the best known architect of Spanish Neoclassicism and his father was the sculptor Juan de Villanueva and his brother, Diego de Villanueva was not only his protector, but his teacher. He entered into the Royal Academy of Fine Arts of San Fernando as a pupil when he was years old. In 1758, he travelled to Rome to become a grant holder of the Academy to complete his studies, in 1765, he returned to Spain. A year later, he travelled through Córdoba and Granada, where he, together with José de Hermosilla, the drawings from these travels were published in 1804. 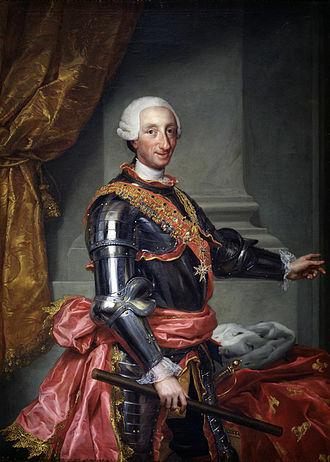 He settled in Madrid, where he was appointed Academic of the Academy of San Fernando, in 1777, Charles III appointed him Architect of the Prince and the Infants. From to the end of his life he would work almost exclusively for the Royal House, in 1781, he was appointed Architect of the Royal Monastery of El Escorial, and Charles IV appointed him Major Architect. 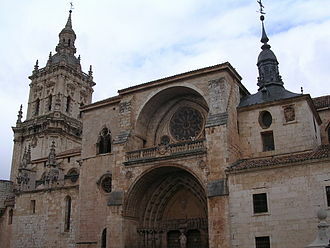 The Burgo de Osma Cathedral, founded in 1232.